Panel discussion about stabilization in unstable areas. How can fragile states that were or are involved in armed conflicts and wars be stabilised? Where should and can state and non-state actors start when there are hardly any functioning structures and effective partners? These and other issues were discussed by expert policymakers, academics and practitioners during a one-day conference on “Stabilisation in Fragile Contexts” held in Berlin in mid-January. 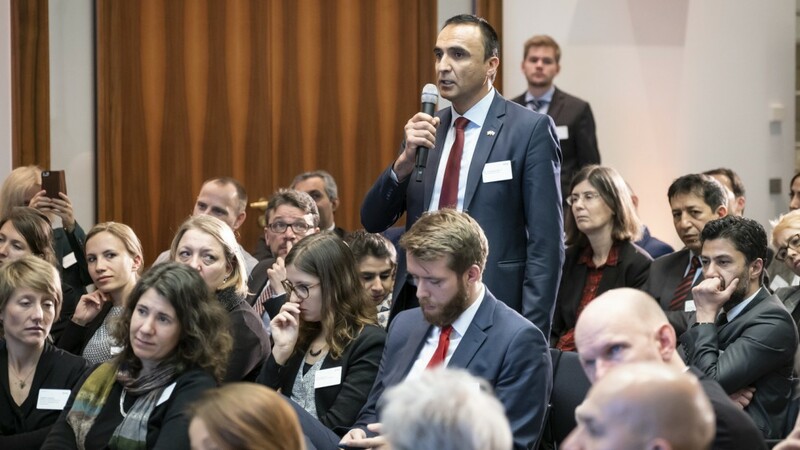 About 100 participants accepted the invitation of KfW, the German Federal Foreign Office, the Aga Khan Development Network (AKDN) and the British think-tank Chatham House. Around two billion people live in countries afflicted by violence, conflict and uncertain political conditions. As a result, poverty, hunger and human rights violations occur or are exacerbated. Public safety can often not be guaranteed and the supply of public services such as water, energy, education and health care is inadequate. The OECD lists 58 countries in its Fragility Report 2018 – including countries as diverse as Afghanistan, Syria, Southern Sudan, Haiti and Pakistan. This diversity is also reflected in the diversity of the stabilisation measures that international development cooperation organisations or non-governmental organisations are trying to implement together with state actors. On the basis of experiences in Afghanistan and Iraq, discussions took place on how state institutions can be established in fragile situations and how governance can be strengthened – even if capacities and capabilities are lacking or state institutions have no political legitimacy. The Aga Khan Foundation, ACTED, Mercy Corps and KfW are working together to build basic infrastructure and improve people's living conditions in 50 communities under the "Stabilisation Programme in Northern Afghanistan". A recently published study on the programme's impact – which ran for almost the entire ten-year period – highlights the fact that a large portion of the local residents surveyed perceive the state as having a stronger presence – in a positive sense – and welcomed the involvement of local district development councils. Even more difficult – due to the security situation – is implementation in countries such as Syria, Yemen or Southern Sudan, where areas are occupied by armed rebels and/or foreign military – the situation is often volatile and very chaotic. How do development cooperation programmes need to be designed to meet the needs of the suffering population? 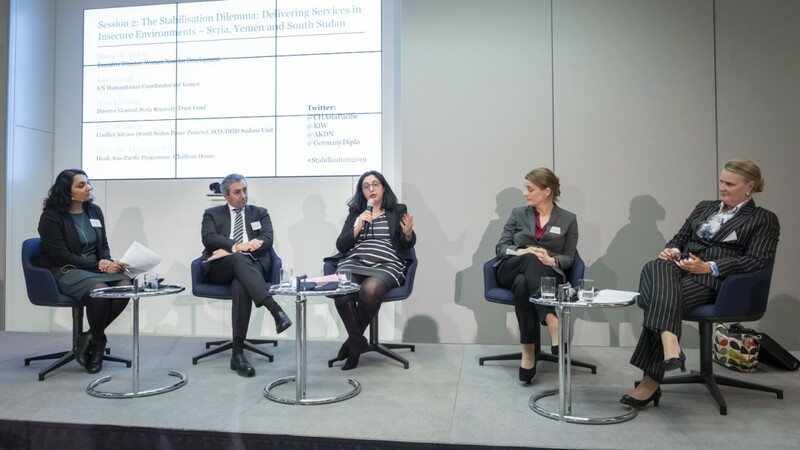 Lisa Grande (UN Coordinator for Yemen) reported on this issue for Yemen, Hani Khabbaz, Director General of the Syria Recovery Trust Fund for Syria and Claire Staunton of DFID for Southern Sudan. Participation of guests from fragile states. The SRTF works with local partners in areas held by the moderate opposition and in the Kurdish areas of north-eastern Syria. Over the last six years or so, this has secured the supply of food, energy, water, agricultural machinery, seeds, etc. for the population there. A positive interim result – because it is uncertain how long the SRTF will be able to continue its work in Syria. Lise Grande quoted a study that found that 6 of 7 UN projects failed. Evidence that most risks can't be contained. But doing nothing is also not an alternative. Very important for planning: thinking local, starting at local level. And: rapid assistance in emergencies as well as staying power – sometimes for decades – are both required.